Welcome to Clean My Pavers! Clean My Pavers - Why? Pavers are a durable product designed to with-stand many weather conditions. Many people have had them installed under the premonition that they do not require maintenance. Truth -be- told all investments need to be protected and maintained. Concrete grows mold and stains. Clean My Pavers can remove these free radicals from many surface materials such as concrete, brick, travertine, natural stone and retaining walls and make your patio, pooldeck, driveway or walkway look like brand new. We can apply an inhibitor to reduce the growth of mold . 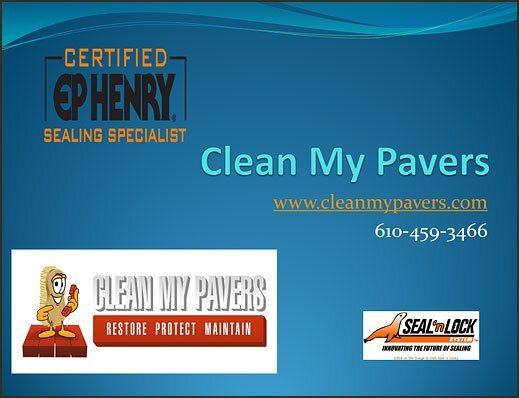 Clean My Pavers ~ The Paver Pros understands the financial investment you have made in your property and its hardscaping. Clean My Pavers is more than a Powerwash company. We are a full service Hardscape Restoration Company providing structural repairs, hot-water powerwashing, joint sand replacement, and sealing applications. Our professional method of cleaning removes mold, moss, weeds, rust, oil, grease, paint and food stains. Typically a patio can be cleaned and sealed in one day. If it is extra-large or requires structural repair the process takes a little more time. The Clean and Seal Process minimizes the amount of time during which you can’t use your patio. Cleanable surfaces include; concrete, pavers, natural stone, travertine and brick. Once your hardscape is cleaned and sanded, a sealer should be applied in order to protect the surface and stabilize the joint sand. In most restorations we use Seal N Lock Products. The use of Seal N Lock allows us to apply the sealer immediately after cleaning and sanding the surface. Seal N Lock is a water based product with a low VOC content, it is environmentally safe. Seal N Lock does not hurt plants or pets. It is odor free and does not contain toxic chemicals. Seal N Lock is currently the only One Day Process. Other sealing processes take 3-5 days to complete. Spring Cleanup and concrete paver protection. Concrete pressure washing. Clean My Pavers can come out after the winter chill to clean and seal your dirty paver patios, pool decks, pavers and provide concrete cleaning. Power wash, pressure clean and seal for a new clean look! What are you waiting for? You need to get on the schedule now. Call Clean My Pavers today. 610-459-3466 or complete our form in the Contact US area. Concrete Cleaning applies to all concrete surfaces. Pool decks, sidewalks, patios and driveways. You need to schedule Spring cleaning now.